Notes: TCU is 1-2 against Tech Tech the last three years and lost both games by a total of 13 points (56-53 in’12, 20-10 in ’13). However, last season the Horned Frogs broke out with a dominating 82-27 victory. This is the first Big 12 game of the 2015 season for both teams. TCU is averaging 49.7 points per game this year and has a very balanced attack led by Heisman Trophy candidate quarterback Trevone Boykin. 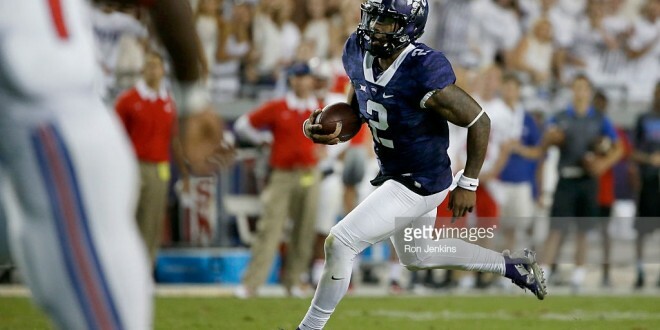 The Horned Frogs are rushing for 231 yards per game and are throwing for 367 yards per game. RB Aaron Green leads the team rushing for 272 yards averaging 6 yards per carry with 4 touchdowns. Boykin has shown poise and confidence in the system during the first 3 games so far and is completing 65.7% of his passes for 985 yards with 10 touchdowns and 3 interceptions. Wide receiver Josh Doctson is Boykin’s favorite target and leads the team with 17 receptions for 326 yards (19 yards per catch) and 3 touchdowns. Boykin is a mobile quarterback who can extend plays with his legs and has added 2 touchdowns on the ground through the first three games. Lubbock is a very difficult place to play and in order to get the victory on Saturday, the offensive line will need to open up running lanes and allow the Horned Frogs to rush the football against the Texas Tech front seven. If TCU has success rushing the football, the Horned Frogs can control tempo and allow the defense to be aggressive against the Red Raiders. Defensively, TCU is solid allowing 20.3 points per game and has been excellent at getting pressure on opposing quarterbacks recording 9 sacks on the year. Head coach Gary Patterson stresses defense and the Horned Frogs are very disciplined in their defensive schemes. TCU is allowing 156 rushing yards per game and 182 passing yards per game to their opponents. However, on the year, TCU has not been creating many turnovers and the team is +1 in turnover margin on the season. Last year, TCU feasted off of creating turnovers (especially on the road) and had one of the best turnover margins in the nation with a +18 mark. In order to get the victory on Saturday, the team will need to force pressure on the Texas Tech offensive line and create turnovers to give their offense great field position. If TCU falls behind early, the crowd will get behind Texas Tech and could be a factor as the game progresses. The Red Raiders are coming off of solid road victory over Arkansas (35-24) last week in Fayettville. Texas Tech ripped the Razorbacks for 486 total yards of offense en route the road win. On the year, the Red Raiders are averaging 54.3 points per game and seem to have better offensive balance this year. The team is averaging 191 rushing yards per game and throwing for 399 yards per game through the air. Last season, the team struggled running the football consistently and averaged 153 rushing yards per game in 2014. However, the offensive line is playing very well early this season in both run blocking and pass protection (0 sacks allowed). Quarterback Patrick Mahomes is the triggerman for the Red Raiders potent offense. Mahomes looked sharp and in control last week on the road and will need to have another solid performance at home this week for the team to get the upset. On the year, Mahomes has completed 66.4% of his passes for 1,029 yards with 9 touchdowns and 3 interceptions. Wide receiver Jakeem Grant is the team’s big play threat and is having an outstanding season so far with 21 receptions (7 receptions per game avg.) for 287 yards with 1 touchdown. Running back DeAndre Washington will be looked upon to carry the workload on Saturday night. Through 3 games, Washington is averaging 7.9 yards per carry (287 yards) with 1 touchdown. In last years road loss to the Horned Frogs- Texas Tech rushed for only 101 yards per game. They will need to have a better effort at home to get the victory this weekend. Defensively, the biggest turnaround in the 2015 season has been turnovers. The Red Raiders are creating them against their opponents and are +5 in turnover margin compared to last season’s -13 mark. Texas Tech must get pressure on Boykin and company this weekend and will need to utilize blitz packages to force Boykin into quick throws. Through the first three games, Texas Tech has recorded 3 sacks. The Red Raiders cannot afford to give up the big play on Saturday which will put pressure on Mahomes to answer each score by TCU. Texas Tech will be challenged between the tackles on Satuday and must step up. Last week the Red Raiders allowed 224 rushing yards to Arkansas and will need to have a better effort at home. On the year, Texas Tech is allowing 234 rushing yards per game and allowing 257 passing yards per game.